• The average weight of a spinet or console is 300 to 500 pounds. A full-size upright might be 700 pounds, a grand piano from 500 to 1,000 pounds and a concert grand may weigh in at a hefty 1,300 pounds. • The keyboard to the back of the piano top might measure 72” and the width of the keyboard area may be 59” in a grand piano. What does this all mean? That the piano is an unwieldy, bulky item that is top-heavy and tough to move. • Being mindful that because it is top-heavy, a piano can easily tip over. • Checking and cleaning the casters, if needed, to make sure the instrument can be moved easily. • Raising a piano properly with all of the basic lifting techniques such as using the legs to hoist the heavy object. • Protecting the delicate exterior parts including the pedals and legs. • Being watchful of the floor to avoid any potential gouging. • Clearing all obstacles out of the way. • Avoiding unnecessary strain on the instrument by minimizing the degree of any lifting. The objective of a successful piano move is to get the piano where it needs to go without damaging the instrument in any way and so that the movers do not get hurt in the process. 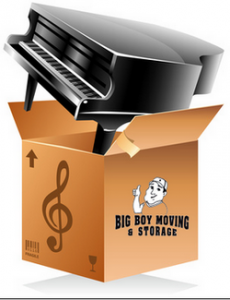 At Big Boy Moving and Storage, we have the manpower (It can take quite a few movers to successfully move a piano. ); we know how to navigate down stairs and in and out of doorways/halls and have completed dozens of successful piano moves in the Fort Lauderdale area. When you are seeking an affordable piano mover to move your precious instrument, call the Big Boy Moving and Storage at 786-292-2920. We are expert piano movers in Fort Lauderdale, Hollywood, Davie and Miami. Remember, you don’t want the cheapest piano mover, you deserve the best piano mover.